On April 14, 2018, the Claremont Institute hosted its 2018 Annual Dinner in Honor of Sir Winston S. Churchill in Newport Beach, CA. U.S. Senator Tom Cotton of Arkansas was the keynote speaker, and was presented with the Claremont Institute’s Statesmanship Award. After completing the fellowship program, Senator Cotton went on to graduate from Harvard Law School. The attacks on September 11th prompted Cotton to leave private law practice and become an Infantry Officer for the United States Army. Now the youngest member of the Senate, Senator Cotton has distinguished himself as a stalwart and thoughtful proponent of conservatism. 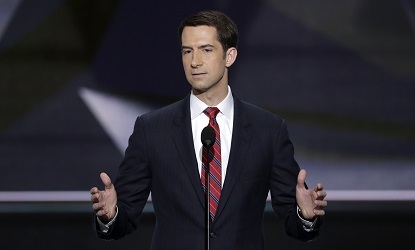 A true patriot and statesman, Senator Cotton is informed by high-minded attention to the principles of American political justice, properly understood. The Claremont Institute was proud to present Senator Cotton with its Statesmanship award. Mollie Hemingway (Lincoln Fellow 2014) served as the Master of Ceremonies. Hemingway is a Fox News contributor and senior editor at The Federalist. Learn more about Mollie here.